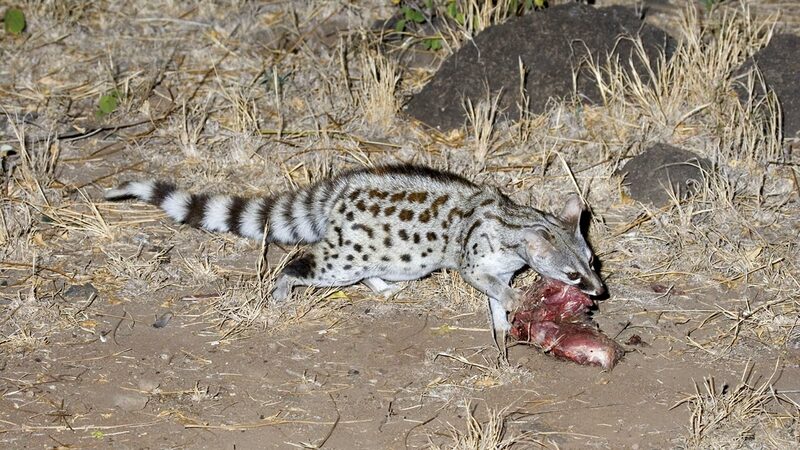 The small, catlike genet is extremely common in Africa. Nocturnal, secretive, and shy, the fox-size common or small-spotted genet has black marks on its face that give it the appearance of wearing a mask. 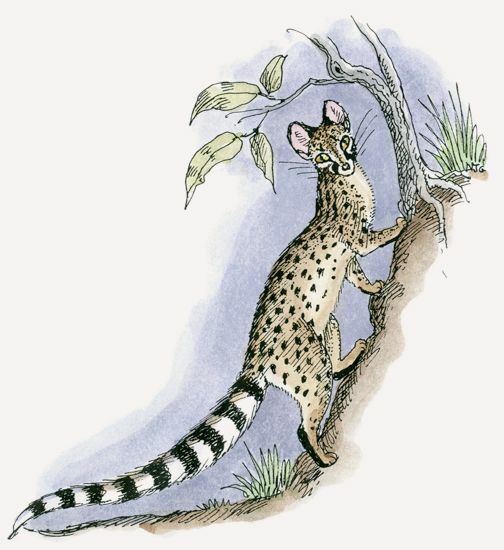 The spots on the back of a genet’s coat are arranged in parallel lines and become elongated as they approach the tail, which has distinct black rings. Blotched genets are close relatives and share a similar facial mask, but they have larger spots and black-tipped tails. Both live at Mpala. Where do common genets sleep during the day? Common genets prefer protective spaces such as hollow logs and holes in trees, underbrush, or rocks. Common genets lead solitary lives. 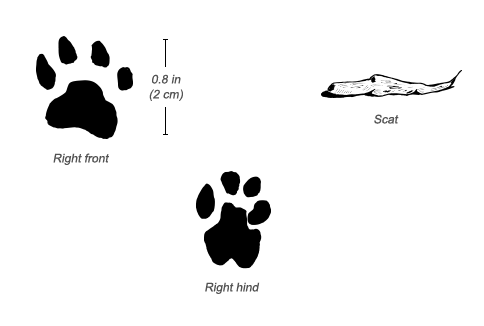 Males and females maintain small home ranges, varying in size from less than 0.4 square miles (1 km2) to as large as 0.8 square miles (2 km2). Although genets prefer an independent lifestyle, their home ranges overlap. Common genets communicate using smell and body language. They secrete a substance from microscopic glands in the skin that identifies the social and reproductive status of the individual. They also use strong-smelling urine for marking and when under stress. Feces include the scent-marking secretion. To intimidate aggressors, the common genet hisses and shows its pointed teeth while raising the long, black hairs down its back and erecting its tail, much like a threatened cat. Mothers and their young call to each other and also communicate using visual and olfactory cues. Fully nocturnal, the common genet is extremely active in total darkness and rests during the day. Although they’re good climbers, common genets spend most of their time on the ground, only ascending trees to look for food or to escape danger. When walking, they hold their bodies close to the ground and their tails horizontal. To travel long distances, they typically follow roads, game tracks, or dry streambeds. The common genet population is robust throughout its large swatch of habitat. They are abundant in protected areas, though they are sometimes hunted for medicinal and decorative purposes. The most wide-ranging of the 14 genet species, the common genet lives in three main regions across Africa: coastal northern Africa, West Africa to East Africa south to Tanzania, and southern Africa. The common genet also lives in southwestern Europe and the Middle East. Common genets occupy a variety of ecosystems across their vast distribution. Though they prefer to live in areas with trees, bushes, and a definite dry season, they can survive anywhere that has enough prey and woody or rocky shelters. Primarily carnivorous, common genets eat small mammals, birds and their eggs, reptiles, amphibians, and fish. They will enhance their diet with fruits, insects, mushrooms, and garbage. In North Africa, the long-tailed field mouse forms the majority of their diet. Common genets climb trees to gather fruit and hunt roosting birds. They also like to hunt domestic poultry. The breeding season varies across regions. 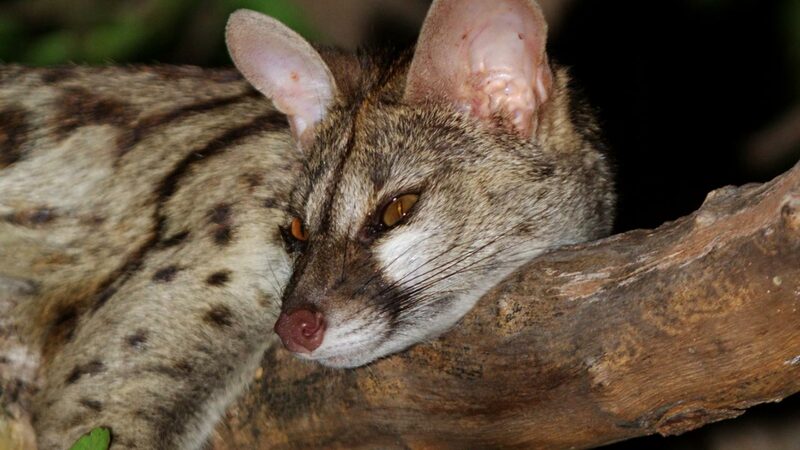 In West, East, and southern Africa common genets breed during the wet seasons. In North Africa and Europe, they breed during spring and autumn. In the courtship stage of mating, (which has only been studied in captivity), the male increases his scent marking frequency while the female decreases hers. Females reach sexual maturity at two years of age and gestate for 10 to 11 weeks. They give birth in hollow trees or abandoned burrows to one to four young. At birth, young genets weigh two to three ounces (60 to 85 g) and gain weight slowly. At 45 days after birth, the young begin eating solid food, though they do not start hunting until fully developed at 18 weeks. The mother provides milk to her young until they become successful hunters. Predators that hunt common genets include servals, caracals, leopards, honey badgers, and large owls. Although the genet is one of the most common carnivores, there is no figure for how many of these elusive animals exist. 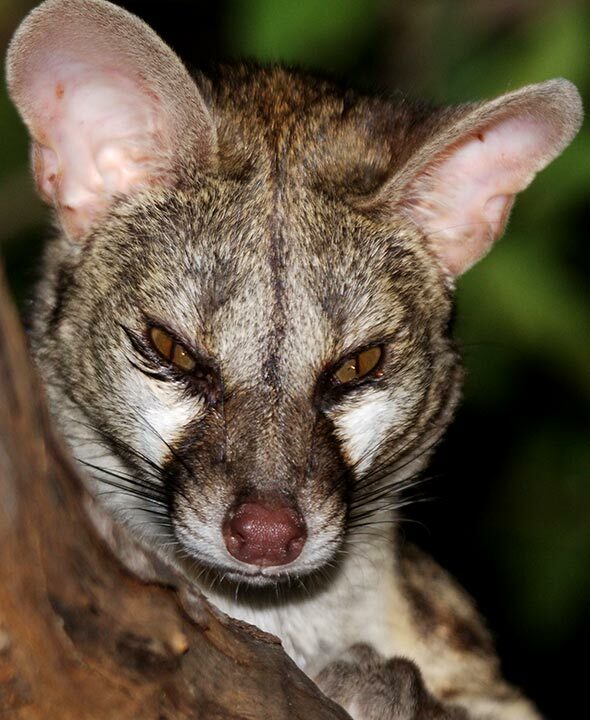 Common genets share communal latrines with other genets, civets, and some mongoose species.